At Bishop Eustace Prep, the private Catholic high school in Pennsauken that has sent generations of graduates to prestigious colleges and universities, 2019 began with a jolt. Angelo Milicia, chief administrator at the landmark Route 70 campus, was out of a job. He had been appointed just 18 months earlier, before the spring 2018 layoffs of about a dozen employees, including teachers and administrators who had been part of the close-knit Eustace community for decades. Like the layoffs, which took place just before graduation, the announcement about Milicia’s fate (“the board of trustees appreciates his years of service”) was uninformative. The latest abrupt change seemed contrary to the familial tradition of Eustace, a relatively small school of between 500 and 600 students that is known for academics as well as athletics — particularly its powerhouse boys baseball team. It’s not uncommon for the children of graduates to attend and be taught by faculty who taught their parents, or are alumni themselves. Said his ’83 classmate Cindy O’Donnell, a Moorestown resident who also has a daughter at the school: “The way this is being done, and with us not being told anything, is frustrating and scary. We want to know the motivation behind [the changes], and where this is going." The layoffs sparked a brief walkout by some students and a mini-exodus of professionals who took new jobs at Holy Cross Preparatory Academy in nearby Delran. And Milicia’s departure touched off an explosion of discontent on social media, with some comments on the school’s public Facebook page describing the move as “heartbreaking” and “sickening” evidence of institutional decline. Eustace was founded in 1954 by the Society of the Catholic Apostolate, commonly known as the Pallottines. Milicia, a 1995 Eustace grad and the first lay person to head the school, did not respond to several email messages. A mutual friend said the father of three did not want to comment. Headmaster Philip Gianfortune is listed as the top administrator on the school’s website. “A process of identifying a new Head of School who should be in place in the coming weeks” is underway, according to the announcement also posted on the website. The statement left some in the school community alarmed, rather than reassured. “What was he talking about? People are scared for their children’s education and worried about the livelihoods of teachers they love,” said one parent. It does seem that a wall of silence is firmly in place. 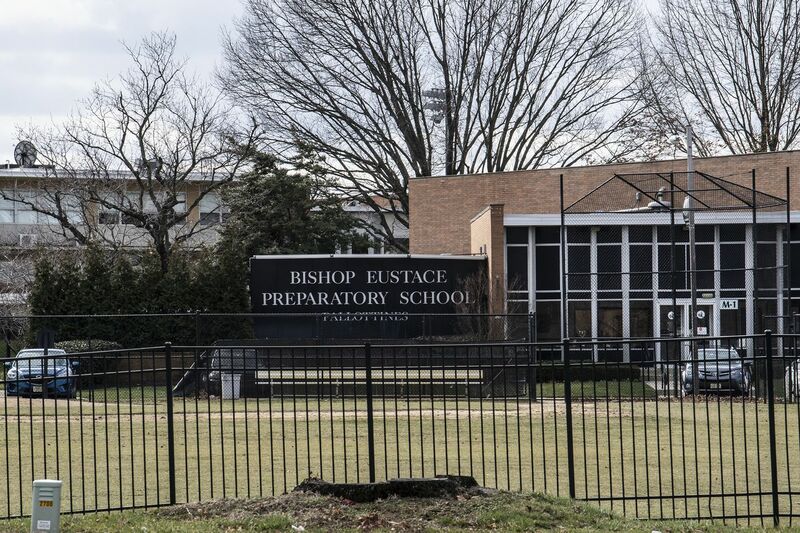 “The Board of Trustees of Bishop Eustace Preparatory School has no comment,” lawyer Kathleen Nagle said in an email — although she did go on to dismiss the notion that the administration is considering converting Eustace into a charter school. Others described on social media or elsewhere as involved with the administration’s efforts declined to comment. And several parents who told me they were eager to speak abruptly changed their minds. I can’t say I blame them: They’re paying annual tuition of $17,000. Their kids are upset. And the ham-handed way the trustees and whoever else are handling whatever strategic planning is underway hardly inspires confidence. “When I went there, my experience was nothing short of sensational,” said McQuillan, a three-sport athlete whose dad coached at Eustace. "Now I’m extremely concerned. There’s a lack of the leadership and the vision that I experienced. “We as alumni and parents don’t know what financial position the school is in. We don’t know what we can do to help,” he said. “There are so many alumni who would be ready to step up if they tell us what the situation is,” said O’Donnell. “At an event we had at the end of November the turnout was unbelievable. This sort of loyalty is priceless. The trustees and the lawyers and the consultants ought to recognize and be grateful for it. And they ought to provide members of the Eustace community with the information they deserve, as well as the chance to help ensure that the institution they love will endure.